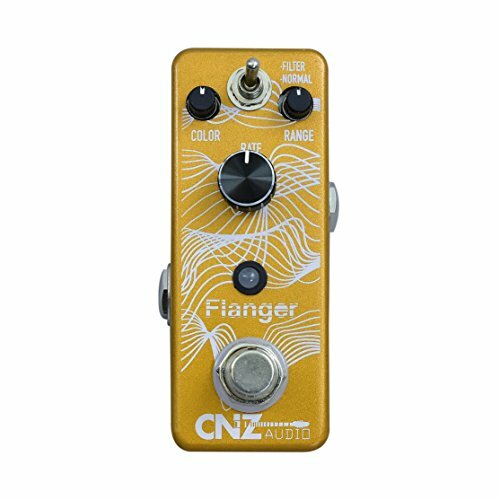 This CNZ Audio Flanger Pedal has a solid metal housing and weighted knobs with easy to read labels. The pedal is gold with a great warbling graph design. While it has a solid build, its mini size also allows it to be lightweight, easy to travel with, and leaves plenty of room on your pedalboard. The bottom of the pedal has a thick rubber pad to keep it still on any surface. Don't be fooled by the size of this pedal. Get the exact tone you're seeking by dialing in the easy to use knobs! With controls for adjusting the Flange Rate, Color, and Range, you are the master of the pedal. It's broad flanger sounds make this a must for any pedalboard! With the simplicity of a classic pedal and easy to use hardware, this pedal is great for beginners and also provides a wide range of sounds one would want as an advanced player. At any level, The CNZ Audio Flanger has great sounds for any user. Inspire Your Music with CNZ Audio! The Flanger Guitar Effects Pedal from CNZ Audio brings that classic, warm and wildly popular flanging effect all into one compact pedal! This pedal can spice up your playing with a crisp and clean flanging sound all while preserving your unique guitar tone. The Toggle switch allows for a choice between 2 different settings for your electric guitar. With the Switch set to Normal, the Flanger will send it's unique, flanging signal through your pedal chain. When you change the Switch to Filter Mode, the pedal will add bed of warmth and fluctuating tone underneath the original flange sound. The Color Knob adjusts the amount of signal that will be influenced by the flange effect. Turn this Knob down for a more subtle effect and crank it up for an intense flange! The Range Knob adjusts the depth of the flange effect. Turning the Knob clockwise will increase the depth and turning counter-clockwise will decrease the depth of the effect. The Rate Knob adjusts the speed at which the flanger will modulate. Dial in the perfect speed to play along with your favorite songs or create your own effect! The True-Bypass Footswitch allows for your tone to come through the pedal unaffected in the "off" position. Inspire your Music with CNZ Audio!